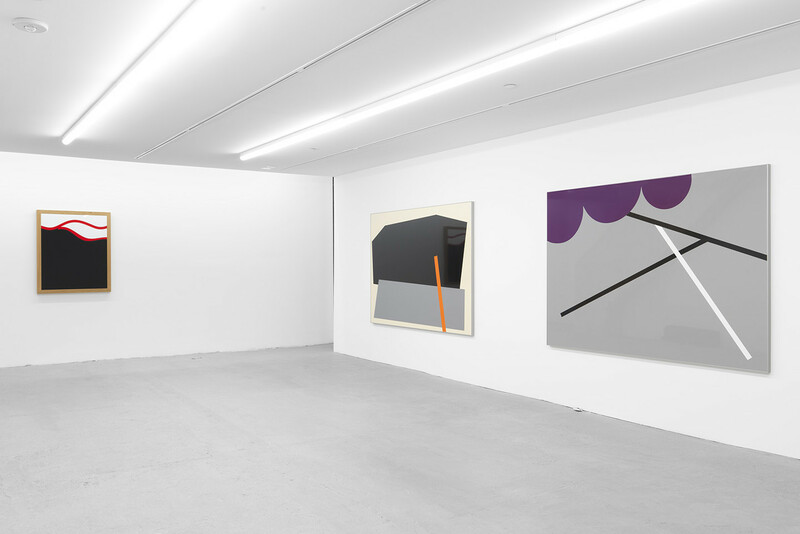 Courtesy: Galerie Eva Presenhuber, Zurich / New York. 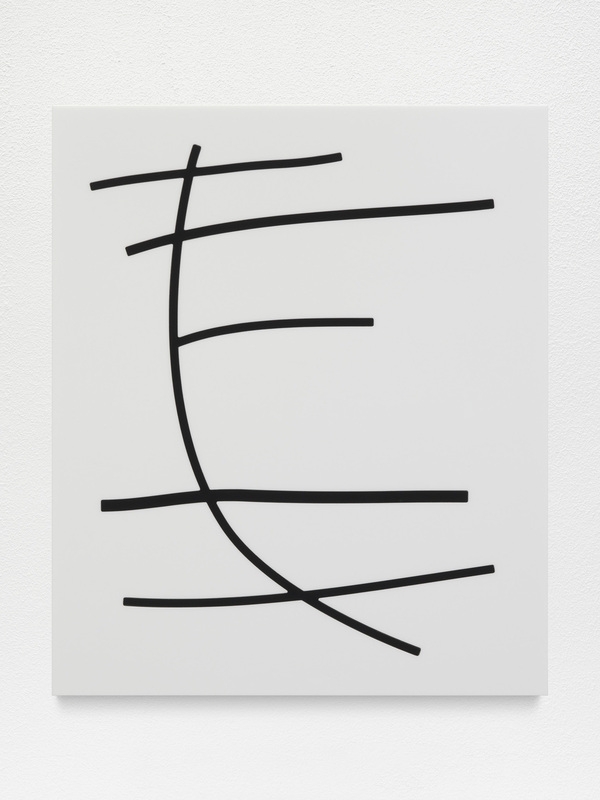 Eva Presenhuber is pleased to announce their 10th solo exhibition with Berlin-based Austrian artist Gerwald Rockenschaub. 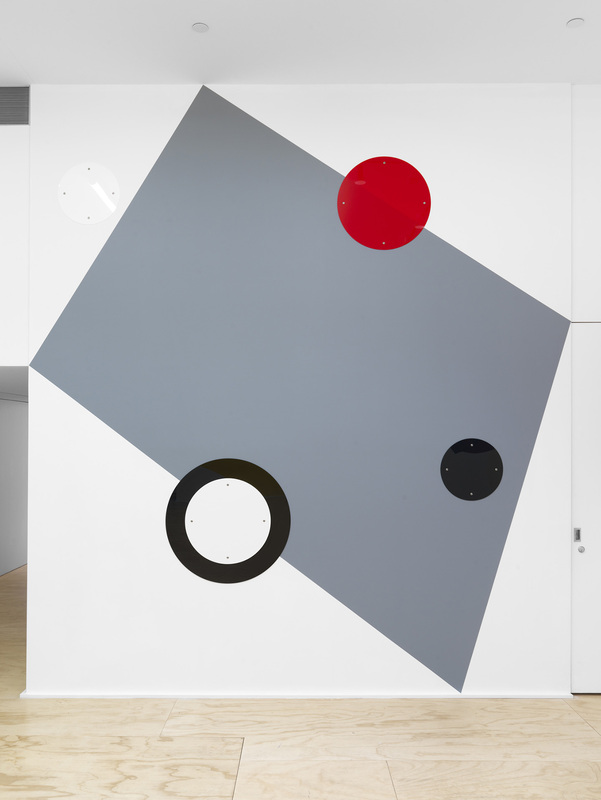 For geometric playground (flamboyant edit), Gerwald Rockenschaub designed a new wall installation in the main showroom space. 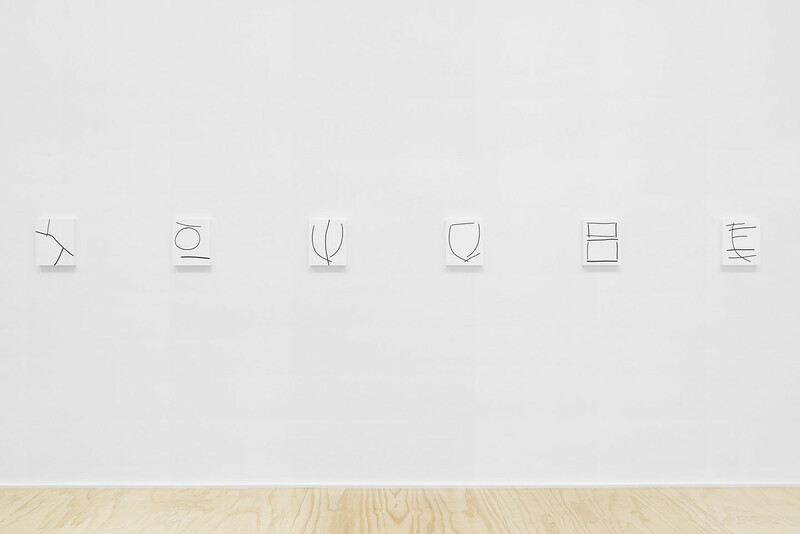 Four wall works complement one another, a counterpoint comment on each other and thus form a rhythmic whole. The wall works consist of painted surfaces and objects made of acrylic glass. Because of the different materiality of the wall and the mirroring acrylic glass, it is difficult to tell from afar whether the work is flat or three-dimensional. In a way it is both: the 1/8 inch thick objects are three-dimensional, but they are silhouetted against the walls not through their plasticity but rather through their surface effect. The acrylic glass diffusely mirrors the spectators’ movements through the space. The work thus questions two basic properties of walls — their planarity and their statics. Perfectly crafted and flawlessly installed, the wall works render an aura of hyperrealist perfection. The acrylic glass objects are put up with acrylic screws—and thus ironically appear as functional objects, while being so perfectly chosen and installed that functionality itself appears as a gesture. Playing with function and pseudo-function, Rockenschaub blurs the boundaries between art and design. 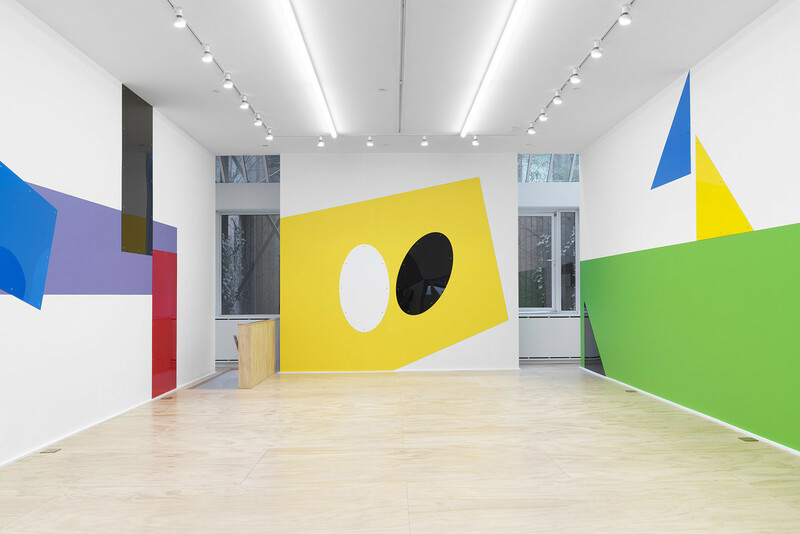 The painted surfaces with their translucent colors both repeat and are attuned to each other, creating a rhythm of minimal forms that leads the eye through the room. Their size gives structure to the space, while their mirroring effects give rise to a dialogue between architecture, artwork and spectator, constantly renewing the relationship of the latter to the former two. Rockenschaub’s work could be understood as a comment on architecture and at the same time as an intervention into the white cube space. The wall installations are flanked by smaller works, acrylic glass intarsia, works made of lacquered MDF, as well as colored foil on aluminum. 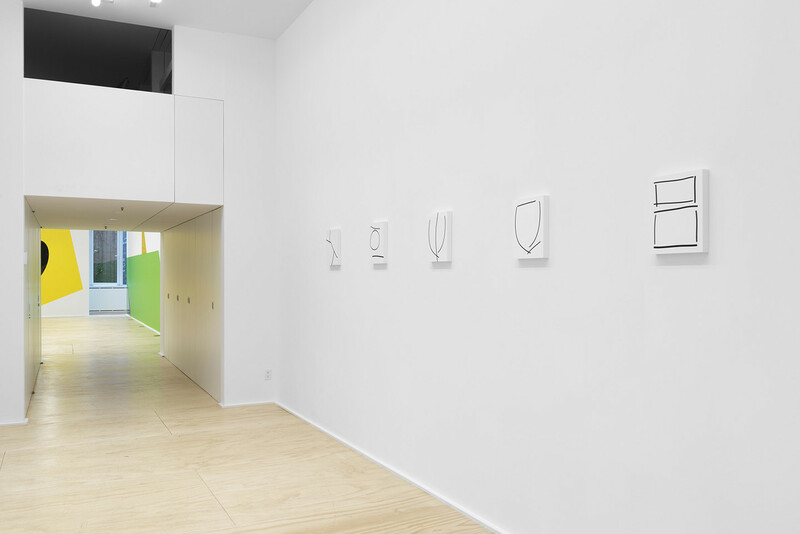 Rockenschaub has arranged in a new format works from five series from the 2000s and 2012s and adapted them for the entrance area and the lower level. Gerwald Rockenschaub works within a formal repertoire which he has been developing since the 1980s. 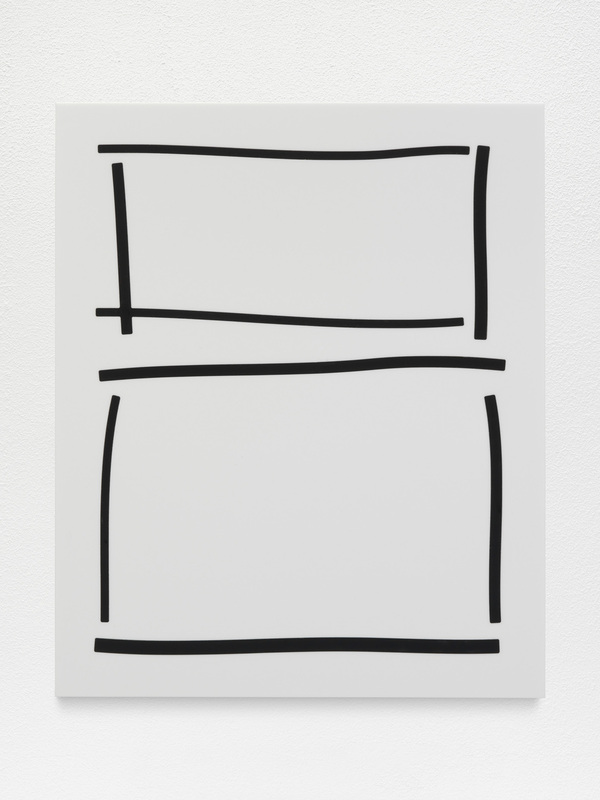 His works come close to being Minimalist but in contrast do not negate Pop. He absorbs the everyday of logos, traffic signs and pictograms, and ingests new influences without indicating them. Partly influenced by his work as a techno DJ and composer of electronical music, Rockenschaub created his own Minimalism veering close to Pop. His work’s relationship with music is quite discernable. 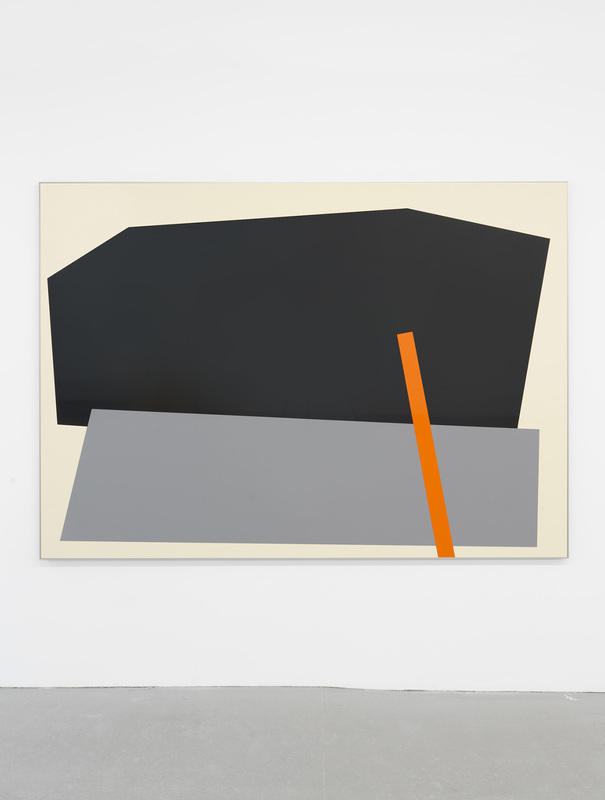 As early as the late 1980s, Rockenschaub turned away from painting and started to have his works produced industrially. He designs them by combining forms according to rhythm and effect on his computer before they are produced (instead of made). The exhibition title echoes the techno sphere, too. geometric playground (flamboyant edit) could also work as a title for a DJ set and embodies the intermediate state of Rockenschaub’s techniques. What, as a techno title, would be taken as a visual metaphor, can be understood literally in this case: this piece is about geometry and flamboyancy. Just as techno becomes suitable for dancing Rockenschaub always includes the pragmatic context explored by the spectator. His installations concern the structuring, limiting, and entering of space. In other works, Rockenschaub separated whole rooms or gave the visitors the chance to explore different perspectives with the help of installed stairways and scaffoldings. 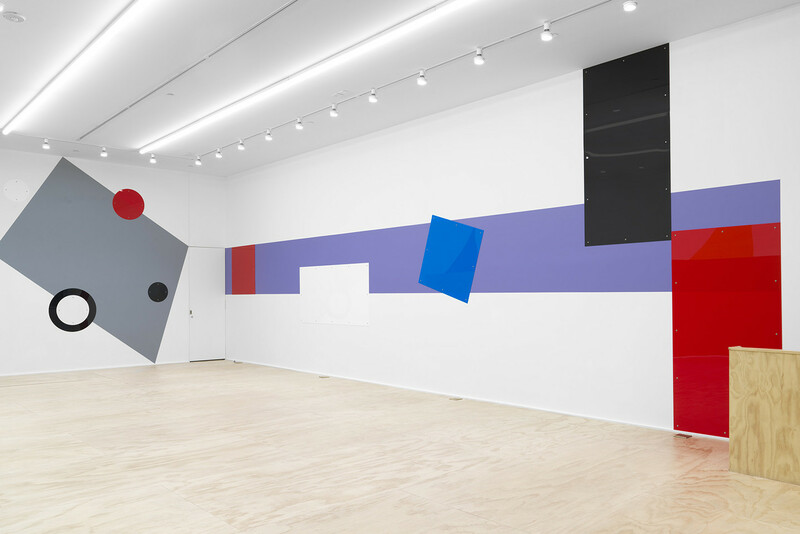 The combination of the wall work in the main space with the smaller works unveils how Rockenschaub adapts his formal lexicon for different formats and different spaces.